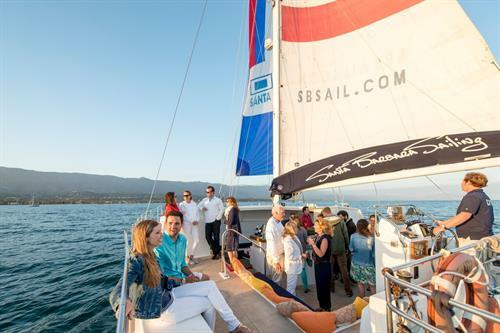 Come Santa Barbara Whale Watching aboard the 50′ Sailing Catamaran, the Double Dolphin. This is an amazing treat that you and your family will remember forever! Morning and afternoon trips leaving daily! The Santa Barbara Channel is home to an incredible assortment of marine mammals, including over 30 different species of whales and dolphins. The most common whales sighted on our whale watching adventures are the majestic Pacific Grey Whales, but sometimes we also see the enormous Blue Whales, which can reach up to 100 feet in length and are the largest animals on the planet! On most of our whale watching trips we also see Common, Risso’s and Bottlenose Dolphins, California Sea Lions, Harbor Seals, and lots of other marine life. Occasionally, we are even lucky enough to spot Orcas, Humpback, Minke, and Pilot Whales. College students under 25 with a valid college ID will receive a special rate, Monday – Thursday cruises only (excluding holiday Mondays). Tickets purchased at the college rate are valid for students 25 years of age or younger with a valid college-issued photo ID. ID Card must be presented at check-in, otherwise The Santa Barbara Sailing Center reserves the right to charge the adult rate for the cruise purchased. Please arrive 20-30 minutes early to your cruise.